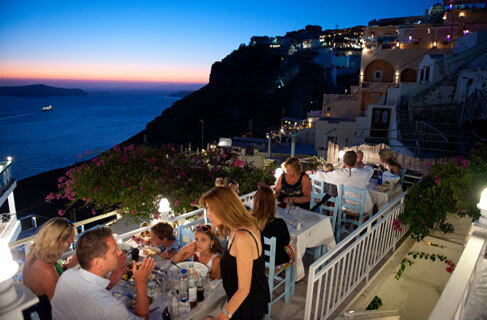 Argo is one of the best choices for lunch or dinner at the Caldera in Fira, combining a spectacular view with a wide range of delicious dishes for all tastes. Konstantinos Hatzopoulos selects fresh raw materials and suggests a variety of hot appetizers, cool salads, traditional Greek dishes, fresh fish and juicy meat. Try from the new menu proposals ‘gyros’ made of sea bass and risotto with octopus, mastic and caper leaves. Great cocktails to accompany your dishes, an elegant ambiance at four levels and a private balcony for eight. Tip: Konstantinos and his team undertakes restaurant consulting.